Where Do GW Students Intern? GW students and alumni meet with employers at the Career and Internship Fair. The George Washington University Center for Career Services offers comprehensive career development, experiential education and student employment services and resources for GW degree-seeking students, alumni and international exchange students. For employers, we offer a variety of services, programs and resources to help them meet their hiring and recruitment needs. Through personalized services such as career coaching, self-assessment, online resume and cover letter development and assistance with networking and interviewing, the Center offers a variety of ways to help GW students discover their talents and interests, decide on an academic major, explore industries and career options and create an effective job search strategy that will prepare them for their transition into the world of work or graduate school. 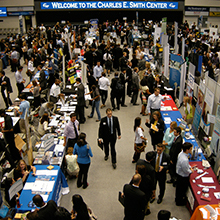 To supplement our individualized services, the Center also features a variety of events and programs such as career and internship fairs, specialized industry career expos, skills workshops and industry-expert panels, employer information sessions, company site visits, and in-house employer consultations. Employers, including alumni, who are looking to connect to GW talent are invited to post jobs and internships to the attention of students and alumni registered in Handshake, our online career management system. Take advantage of opportunities to brand your organization on campus through information sessions, a robust on campus interviewing program and participation in career and industry fairs, programs and panels. Follow GW Center for Career Services's board #GWCareerSuccess Blog on Pinterest.